In my previous blog I explained how to create a new tenant in Office 365 which start with a 30 days trail period. 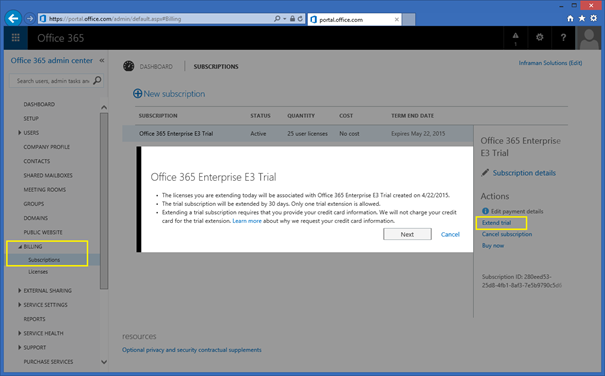 It can happen that you haven’t finished testing within 30 days, so it’s good to know there’s the option to extend the Office 365 trial with another 30 days. To achieve this logon to the Microsoft Online Portal via https://portal.microsoftonline.com and login with the global administrator account. In the main menu select Billing and Subscriptions and in the subscription details (on the right) click Extend trial. To extend the trial subscription you need to enter your credit card details, but your card won’t be charged for extending the trial period. In the pop-up windows, click Next and in the following windows enter your credit card details. Once entered click Extend trial and you’re good for another 30 days. 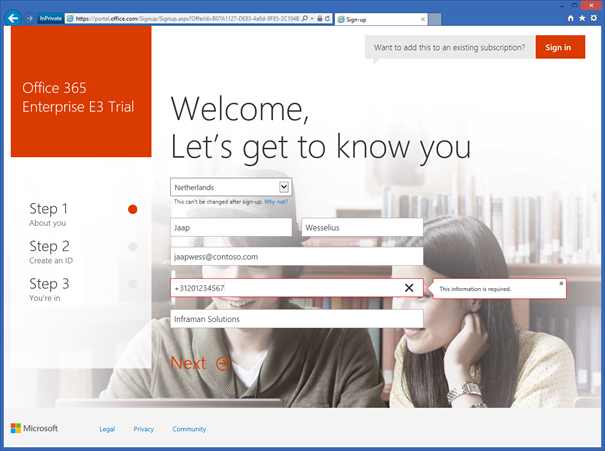 Please note you can extend your Office 365 trial only once. 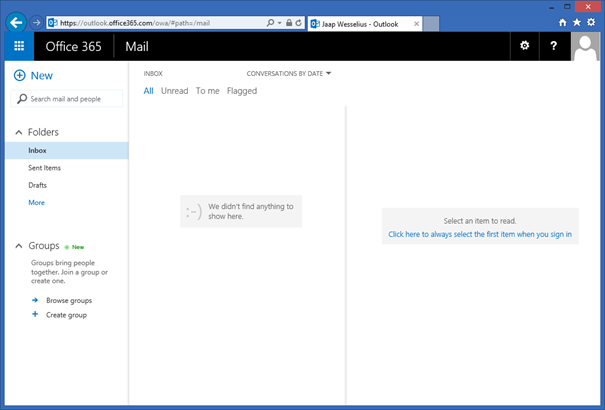 Creating a new organization in Office 365 is relatively easy. You need a valid domain, a unique tenant name and if you want to use it beyond the 30 days trial period a valid credit card. Before creating (or provisioning) a new tenant you have to select the Business Plan that will match your business needs. You can find a nice overview of all Office 365 Business Plans on the Microsoft site via http://bit.ly/CompareAllO365BusinessPlans. When you scroll down you’ll the Business Plans that have a free trial available. In this blog post I’ll focus on the Enterprise E3 plan. 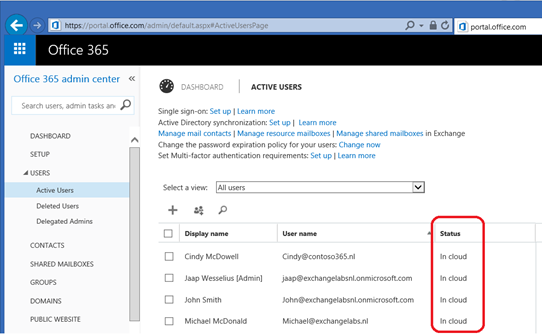 When you click Free Trial at the bottom of the page you can configure a new tenant in Office 365 with a 30 days trial period. You need to enter you name, email address, telephone number and organization name as shown in the following figure. The next step is to create your first user ID. This will automatically the Global Administrator of your Office 365. 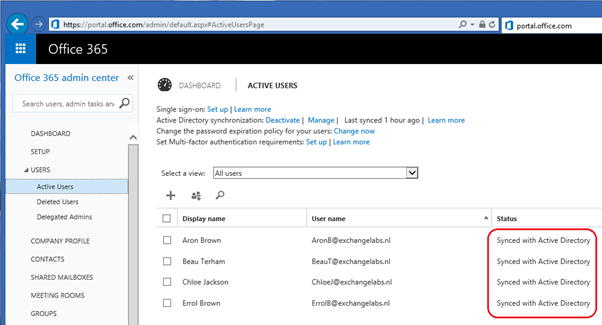 I always recommend not using a regular user for this, but create a dedicated administrator with an appropriate name like admin or administrator.